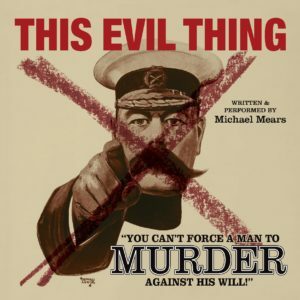 Michael Mears is coming to Edinburgh to perform his play THIS EVIL THING which tells the compelling and inspiring story of Britain’s First World War conscientious objectors, in aid of the Opposing War Memorial. 20 November. 7pm (doors open 6.30pm). The Performance will be followed by a Q&A panel with Michael, and Elisabeth Allen, granddaughter of a First World War Conscientious Objector. Finishes at 9pm. In the play Michael portrays around 52 characters (some with only one line, granted), including Bertrand Russell, Henry Asquith PM and Bert Brocklesby, who was one of the ‘Richmond 16’ group of COs who were sent to France and came within a whisker of being executed. A number of verbatim testimonies from the COs and Russell himself are interwoven into the piece – (which runs at 80 minutes without an interval.) , Michael Mears and his white van arrives in Edinburgh on November 20th. His travels have taken him to regular theatres and theatre studios, but also to Quaker schools in Yorkshire, a chapel in Bristol Cathedral and a 400 seat tent. And during this November, there are four Scottish performances – including as far north as Dyce Parish Church Hall, outside Aberdeen. The audiences have included in the US many Vietnam War-era conscientious objectors, and here in the UK a 99 year old CO from WW2 as well as the granddaughter of Bert Brocklesby, the main CO featured in the play.